So, you're ready to call a landscaper. If only it was as simple as buying a car or shopping for a refrigerator. Where are the online tools to compare aesthetics, design skills and the ability to create landscapes that capture what you're looking for, not to mention install everything efficiently and expertly? Founded in 1979, GLDesigns has designed and installed projects for clients from Hatboro to The Hamptons. We aim to check everything off the above list. For us there is nothing more rewarding than visiting a landscape years later, to see that it has stood the test of time. The background of our team comes from many disciplines: fine art, design, photography, and landscape architecture, giving us a distinct way of looking at things. We also employ master craftsmen for our installations: carpenters, masons, master woodworkers, electricians, and of course landscapers. We want to work with you to bring out the best your property has to offer – for you, your family and friends. 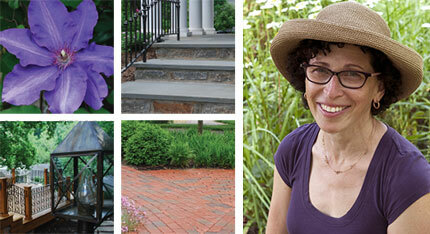 Co-owner and principal designer of GLDesigns, and a graduate of Temple University's Tyler School of Art, Andrea Steinberg draws from her background in art and design, as well as her extensive knowledge of horticulture, to create unique and inspired landscapes. Her work has earned national recognition, including a featured segment on the Discovery Channel's "Home Matters". Andrea also regularly contributes articles to local newspapers and magazines. Along with her husband Gary, Andrea also owns and operates Gary's Perennials and PerennialMarket.com, selling hardy plants to the wholesale market since 1984. "Good design looks like it was easy." "Low maintenance doesn't mean no maintenance".